Dr. Arlene is spreading the Right Fit Method with in-person appearances. American Entertainment International Speakers Bureau represents her. Dr. Arlene Barro is a breath of fresh air in today’s tumultuous job market. Dr. Barro should have her own nationally broadcasted program: 'Dr. 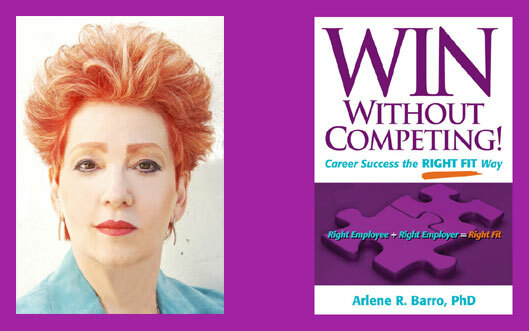 Arlene, The Career Guru'. Much like Dr. Phil and Dr. Oz, Dr. Barro is a charismatic expert in her field. Dr. Barro gives her clients employment hope and specific behavioral modifications using her dynamic and empowering method of personal branding. Dr. Barro coached me to a successful career change following an unexpected and difficult job loss. She gave me the skills I needed to move from a 'woe is me mindset' to an 'I can and will take charge of my future'. The lady has a gift and she wants to share it! To reach audiences around the world, Dr. Barro produces and hosts her WIN Without Competing! talk show featured on the premier internet radio site where she interviews highly successful people and demonstrates how they are using her Right Fit Method in their professional and personal lives. Both on the radio and in-person Dr. Barro, through her storytelling approach, passionately persuades and empowers audiences to view the world through the Right Fit lens and walk down the Right Fit Road to professional and personal fulfillment. Dr. Arlene Barro lives and works on the westside of Los Angeles adjoining UCLA. Are You Hiding Behind the Veil of Email? Throw Out the Barrel of Rotten Apples We make decisions based on the fundamental belief that we must search for the “best”; we compare and contrast. Picture a barrel of rotten apples, pick the “best” one and hold it in your hand. What do you have? A rotten apple. Change your standard from “best” to the Right Fit and watch your entire professional and personal life change in a flash. Throw out the standard of “best” and the barrel of rotten apples. If you focus on the Right Fit, you will make the right decisions. You won’t hire the wrong employees or take the wrong position, nor marry the wrong spouse or buy the wrong house. When you master the Right Fit Method, you will save time and money, reduce stress and feel empowered to soar to new heights. Make No Assumptions: Open Those Doors In all aspects of our lives we make erroneous assumptions. It’s a habit which significantly effects our actions and ultimately the results that we want to achieve. If we act on those erroneous assumptions, watch the negative consequences unfold with a domino effect. Stop making the erroneous assumptions (you’re probably saying “I don’t make any,” yes, you do! ), especially “I can’t do this because…” and open those doors marked “opportunity.” Watch your “luck” change. Cultivate Your Creativity The seeds of creativity are planted in childhood. What if those seeds were not planted and you yearn to be creative or you’re creative and want to become more creative? Can you nurture your creativity as an adult? Absolutely, if you are willing to change your behaviors and unleash your divergent-thinking abilities, which are the keys to the kingdom of creativity. Remember this mantra: Rigidity is the enemy of creativity. Implementing divergent-thinking abilities will help diffuse rigid behaviors. Sprinkle some other new behaviors and a change of attitude into the mix. Then, soak yourself in passion. Oh, you can’t find your passion? Yes, you can. Find that passion and add it to the mix. Now you have all the keys to the kingdom of creativity. For the rest of your life you can develop your creative abilities and experience an amazing sense of fulfillment. Focus on the End Result, Not Your Ego It’s amazing how much time we can spend distracting ourselves from our desired outcomes or goals. If you focus on how you feel about this, that, and the other, you will reduce your ability to succeed. If you are given the choice between leaving your current position (no golden parachute) or taking a step down within your company, would you walk out unemployed because your ego is bruised? Many walk out in this situation. In all aspects of our life we are faced with decisions that involve our egos or other distractors. Figuring out in advance how to handle these situations could make the difference between success and failure in both your professional and personal life. No Competition: It’s All Up to You! Competition and comparison go hand in hand. Stop asking the question “Who is the best?” or “What is the best?” If you compare – looking for similarities – or contrast – looking for differences – you are distracting yourself from focusing on yourself. Instead, set high standards for yourself against which no one can compete. But high standards are not enough. You need to know how to make those standards work for you in a step-by-step plan focused on achieving results. To do that, you will need to implement a unique set of strategies incorporated in the Right Fit Method. The extent to which you achieve the results that you want, either professional or personal, depends on you. There is no competition. It’s all up to you! To arrange for Dr. Arlene Barro to speak, please email Jennifer Orell, American Entertainment International (AEI) Speakers Bureau, or call her at 617-782-3111 Ext. 118. Visit Dr. Arlene's Speakers Page on AEI.